We’d love your help. Let us know what’s wrong with this preview of Tropical Secrets by Margarita Engle. Daniel has escaped Nazi Germany with nothing but a desperate dream that he might one day find his parents again. But that golden land called New York has turned away his ship full of refugees, and Daniel finds himself in Cuba. As the tropical island begins to work its magic on him, the young refugee befriends a local girl with some painful secrets of her own. Yet even in Cu Daniel has escaped Nazi Germany with nothing but a desperate dream that he might one day find his parents again. But that golden land called New York has turned away his ship full of refugees, and Daniel finds himself in Cuba. To ask other readers questions about Tropical Secrets, please sign up. Is this appropriate for 3rd-5th grade? I give Tropical Secrets, A Story of the Holocaust 4.5 stars because this book is too short. Geared toward a teen audience, Margarita Engle writes the story of Daniel a 13 year old German Jewish refugee in Cuba. Fleeing from Berlin right after Kristalnacht (night of crystals), Daniel obtains a visa but lands in Havana rather than New York. At first timid, Daniel makes the most of his situation thanks to his newly found mentor David, a Russian Jew, and Paloma, the daughter of El Gordo, the corrupt I give Tropical Secrets, A Story of the Holocaust 4.5 stars because this book is too short. Geared toward a teen audience, Margarita Engle writes the story of Daniel a 13 year old German Jewish refugee in Cuba. Fleeing from Berlin right after Kristalnacht (night of crystals), Daniel obtains a visa but lands in Havana rather than New York. At first timid, Daniel makes the most of his situation thanks to his newly found mentor David, a Russian Jew, and Paloma, the daughter of El Gordo, the corrupt government official in charge of deciding which Jews stay and which return to Europe. This book is written entirely in song. Daniel eases his pain by discovering Cuban music. His grandfather and parents had been musicians, so after some time, he turns to music as the universal language. In the style of Cuban decimas, Daniel writes his own history as he constantly dreams of seeing his parents again. I thought this book was beautifully written. It teaches about the Holocaust in a way that younger audiences can understand without having to read about the ghastliness of conditions in Europe. Meanwhile, we learn about the time period from a perspective that isn't often discussed, that of Jews who ended up in Latin America because they were able to acquire refugee status in these countries. Read. This. Book. True, it won't be released for a few more weeks. But make note of it now to get to this one when you get the chance. Written by Margarita Engle--an acclaimed verse novelist--the book is the story of Daniel, a Jewish refugee, and the friends he makes in Cuba--Paloma and David. Daniel had no intentions of going to Cuba. When his parents tearfully sent him away--hoping and praying that at least their son may survive--this was right after the Night of Crystal or Broken Glass; they Read. This. Book. True, it won't be released for a few more weeks. But make note of it now to get to this one when you get the chance. Written by Margarita Engle--an acclaimed verse novelist--the book is the story of Daniel, a Jewish refugee, and the friends he makes in Cuba--Paloma and David. Daniel had no intentions of going to Cuba. When his parents tearfully sent him away--hoping and praying that at least their son may survive--this was right after the Night of Crystal or Broken Glass; they all thought that his ship would reach American shores--having heard stories of Lady Liberty and America being the place where all were welcome and the land where dreams could come true. But Daniel's ship was turned away from both Canada and the United States. His one chance for survival now depends on Cuba's mercy. The year is 1939. Does Daniel have a prayer of a chance? This verse novel is told primarily in three voices: Daniel, Paloma, and David. Paloma is the daughter of "El Gordo" a man who is hoping that these refugees will make his wallet fat--very fat. The bigger the bribe, the higher the cost for a visa to enter the country, the richer he becomes. And with the Nazis even sending men to spread propaganda about Jews, the public isn't necessarily on their side--open to the idea of Jews being allowed to enter and settle there. Still, Daniel's ship is allowed. But we're not talking about one ship or even a dozen ships. David is a Jew--a Russian Jew who fled Russia many years before. Paloma helps David--and others--help the refugees providing food and clothing and friendship and support--teaching them Spanish, for example. The book is a novel about many things: hope, life, survival, friendship, tolerance. But it doesn't hide the fact that this was a very ugly, very brutal, very cruel time in history. I don't know about you, but I'd certainly never heard about Cuba in regards to the Holocaust. It's interesting to see how this one island, small in size especially when comparing it to Canada and the United States, was able to provide some shelter to Jews fleeing Hitler. In the author's note she shares, "Despite tragedies and scandals, Cuba accepted 65,000 Jewish refugees from 1938 to 1939, the same number that was taken in by the much larger United States during the same time period. Overall, Cuba accepted more Jewish refugees than any other Latin American nation." Honestly, the women is a maestro with the way she interweaves history with poetry. While there were some parts that were a bit slow, the story and meaning is there. This book is not only important to know the history of Jewish Refugees who were prevented from entering both America and Canada and clung onto Cuba as their last hope but to also know and question just how absurd it is to hate someone on the way they view life. Really humanity I ask you, why hate someone just because what they value and love doesn't coincide with yours? As long as you both are happy and safe does it matter who prays to who or whether they even pray at all? This review has been hidden because it contains spoilers. To view it, click here. If children's authors were given superpowers upon the occasion of their first publication, I know what Margarita Engle's would be. Stealth. She's the kind of author you never see coming. You can pick up a book of hers, be it The Poet Slave of Cuba or The Surrender Tree and you'll never see her wordplay coming. She plays fair, of course. From page one onward you see exactly what you're getting yourself into, sometimes as early as the first line. What you took to be the poor man's version of a nov If children's authors were given superpowers upon the occasion of their first publication, I know what Margarita Engle's would be. Stealth. She's the kind of author you never see coming. You can pick up a book of hers, be it The Poet Slave of Cuba or The Surrender Tree and you'll never see her wordplay coming. She plays fair, of course. From page one onward you see exactly what you're getting yourself into, sometimes as early as the first line. What you took to be the poor man's version of a novel (the verse novel sometimes fails to get the appropriate amount of respect it deserves) instead has taken a board with a nail in it and is now systematically whacking you in the heart with its text. In the case of Ms. Engle, Cuba serves as her muse, and not in the way you might expect (see: Castro). Through her books kids are learning about historical aspects of Cuba that you simply cannot find anywhere else in juvenile lit. She's already tackled slavery in The Poet Slave of Cuba and the war of independence from Spain The Surrender Tree. Now comes the most child-friendly of her novels. Don't mistake the term "child-friendly" with "simplistic", though. Perhaps the best plotted and conceived of her novels, Engle writes her most touching tribute to Cuba yet. As a place where all people with an inclination have found their own true home. He was meant to wind up in New York. That was the plan. When Daniel's parents spent all their money buying their son a ticket out of Nazi Germany, the idea was for him to disembark in Manhattan and meet his parents eventually there once they could get across. Instead, his ship was denied access to disembark in America, and sailed south to Cuba. Determined not to forget his parents, Daniel is so committed to his dream that he even has difficulty even parting with his hot winter clothing during the sultry Cuban days. While there he meets and befriends Paloma. Daughter of a corrupt Cuban official leeching money off the refuges, Paloma spends most of her days in her dovecote, living with the birds. The two kids are also friends with David, a Jewish man who once fled Russia, and who gives Daniel the advice and friendship he needs to move on. Secrets are revealed, friendships strengthened, and Daniel finds a way of living without merely going through the motions. "I have nothing to say / to any stranger who treats me / like a normal person / with a family / and a home." "I was taught that there are four / kinds of people in the world - / wise, wicked, simple, / and those who do not yet know how to ask questions." I'd quote more to you, but many of the best (like a line Paloma has about wolves and saints) retain their power only within the context of the story. Theme... boy, I hate talking about theme. I'm not a thematically minded person. If I notice a book has done something clever with a theme I'll sort of point at it and, in my customary caveman-like manner go, "Theme. Theme good. *grunt*" In terms of Tropical Secrets there was a moment in particular that just killed me. At one point in the book Japan attacks Pearl Harbor and America declares war. In response, the Cuban government arrests everyone who is German and NOT Jewish. Says Daniel, "I cannot understand / how the J / that condemned me / in Germany / has been transformed / into a mark of safety / on this crazy island-" And later, "and will it help them / understand / that those who feel safe today / could be the ones in need of refuge / tomorrow?" I'm always particularly struck by works of historical fiction that can take crazy true facts like this one, and then get to the nut of the situation in as few words as possible. Sometimes I feel like Engle works so hard on her imagery that her plotting suffers. But the gaps I felt in something like The Surrender Tree (a man spends practically his entire life hunting down a woman and then just disappears from the text without so much as a bow?) aren't present here. However, like her other novels I didn't get a real sense of the ending of the novel. [Spoiler Alert:] I appreciated that she didn't tack on a happy ending for Daniel, of course. Had he suddenly met the next boat in the harbor and discovered his entire family safe and well and on-board, that would have been something. As it stands, however, his acceptance of his past serves as its own capper. There is room for a sequel here, though. By the end you have a sense of Daniel's story and where it may go, but Paloma's is still wide-open, waiting for a bit of closure beyond her birds. It's hard to establish character with so few words, but not impossible. In Engle's books, adults are often suspect and flawed. They're victims of their own desires, forgoing basic human decency in the face of greed or obsession. Paloma's father is no exception here. You are allowed a single glimpse into his heart, and the reasons why he does the horrible things he does. But it's a brief glimpse, hardly long enough to make you feel anything for him but mounting disgust. Because Engle likes to switch her point of view from person to person, you have to be constantly on your toes, paying attention to who is saying what. If it works, it's only because she has a firm grip on her own characters. She'd have to in order to make her bad guys understandable and still hideous. I'm not a fan of violence in books and the sheer torture and gore of The Poet Slave of Cuba meant that I could respect the novel but never love it. That's a personal thing. Some of that feeling remained with The Surrender Tree too. Violence was still prevalent, but at least in the text there was a level of distance. Tropical Secrets is the most removed from this kind of sheer brutality, but you can't tell a story about Holocaust survivors and not mention what it is that they are escaping. The first sentence in this book reads, "Last year in Berlin, / on the Night of Crystal, / my grandfather was killed / while I held his hand." You get no extenuating circumstances other than these words on the page. No gory details. Just the horror of your own imagination. It is enough. Every person you meet has a point of view. Engle shows kids this. Even the bad people. Even the mean or confused people. She takes moments when humans have done simply terrible things to one another and then enters their heads. Their thoughts become verse, saying what they cannot or could not. 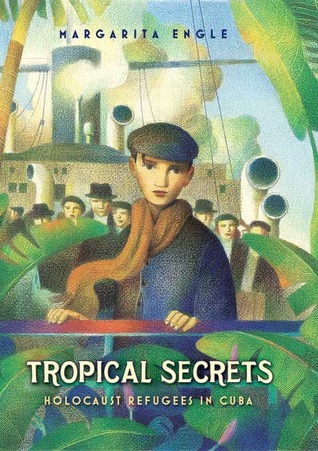 Tropical Secrets sits well with the reluctant reader and the world-weary twelve-year-old with a taste for Steinbeck alike. A person always has to consider whether or not a verse novel really needs to be written in that style or if the author is just being lazy. No one will ever say that Ms. Engle is lazy, though. And this style fits the book like a hand in a glove. A remarkable novel about an amazing and true moment you probably will not find in your average elementary school world history textbook. This book was ok. It was an interesting subject that I haven't really thought of, but it just wasn't interesting enough. I think that with such a difficult topic, I should have felt some more emotion. I think that there should have been a bit more detail, but the book was kind of cute I guess. I don't think that reading it was a waste of time (I learned some new things), I just wouldn't read it again. This is one of the most fascinating topics in history and I was really excited to read about it. I was really disappointed with the pacing and confused by the time jumps. I think that verse really wasn't the best choice for this particular story, as it left a little too much out. Really, though, I noped out as soon as the Jewish character quoted from 1 Corinthians. The story of Holocaust refugees ending up in Cuba is interesting and I would consider investigating it further, but I don't feel like this book really does a wonderful job with it. I think it just fell a bit flat and, as a personal note, I have trouble differentiating between Davids and Daniels in real life so having both names appear as main characters really threw me for a loop. That being said, the fact that it is written as poems could make it a good book to put in the hands of a reluctant re The story of Holocaust refugees ending up in Cuba is interesting and I would consider investigating it further, but I don't feel like this book really does a wonderful job with it. I think it just fell a bit flat and, as a personal note, I have trouble differentiating between Davids and Daniels in real life so having both names appear as main characters really threw me for a loop. Daniel is a young Jewish boy who fled Germany during the Nazi regime. The ship he was on has been turned away from the "golden land" also known as New York. He now finds himself in Cuba facing obstacles he never could have imagined for his young life while he dreams of seeing his parents again one day. Due to discussions between characters of the violence that took place in Nazi Germany this book would be best suited for children grades 5th through 8th. Children who are interested in learning ab Daniel is a young Jewish boy who fled Germany during the Nazi regime. The ship he was on has been turned away from the "golden land" also known as New York. He now finds himself in Cuba facing obstacles he never could have imagined for his young life while he dreams of seeing his parents again one day. Due to discussions between characters of the violence that took place in Nazi Germany this book would be best suited for children grades 5th through 8th. Children who are interested in learning about the Holocaust would be interested in reading this book. Tropical Secrets is from the Sydney Taylor Book Awards List. Since this is written in free verse, the audio version has different narrators for each character which is a nice change from the typical one narrator you get with most stories. However, I don't think this book would have been as effective to listen to without the different voices to help signify when the character changes. Overall, I liked listening to it and found it easy to follow with the different narrators. Paperback edition of Engle's 2009 historical novel about Jewish refugees in Cuba at the beginning of World War II. Full of anguish about leaving his parents behind in Germany, 14 yr old Daniel tries to find peace in the strange tropical country. Befriended by 13 yr old Paloma and the old man David, a refugee of the pogroms in Russia, Daniel finds music and friendship, but is always haunted by the question of his parents' fate. Told in alternating voices, the story paints a picture of the time, Paperback edition of Engle's 2009 historical novel about Jewish refugees in Cuba at the beginning of World War II. Full of anguish about leaving his parents behind in Germany, 14 yr old Daniel tries to find peace in the strange tropical country. Befriended by 13 yr old Paloma and the old man David, a refugee of the pogroms in Russia, Daniel finds music and friendship, but is always haunted by the question of his parents' fate. Told in alternating voices, the story paints a picture of the time, the place and the characters' complex emotions with Engle's signature spare, evocative text. I love how she manages to do so much with such elegant economy. Daniel's story is haunting, and when the story ended I wished I could follow the characters into the next step of their lives. And, once again, Engle helps to flesh out a moment in Cuba's history, about which so little is taught in our schools. Engle does a wonderful job getting to the heart of the story using kernels of truth with every verse she writes. The universal need for love, family, acceptance, friendship, survival... all of these things surface in this story of refugees having to start over in a land not their own. my favorite delight of carnival season. looking down at the beautiful world. two ye Engle does a wonderful job getting to the heart of the story using kernels of truth with every verse she writes. The universal need for love, family, acceptance, friendship, survival... all of these things surface in this story of refugees having to start over in a land not their own. of peeking through any dark curtain. my own powers of thought. I really like Engle's way of telling a story. It was interesting reading a bit more about the Jewish experience in Cuba, especially during WWII. It was more interesting reading it now when refugees, anti-semitism, and propaganda have so much relevance. The poetry in Tropical Secrets is simple, but it hides raw honesty and secrets in its verse. The way Engle uses words gives the reader just a taste of the Cuban culture, through the eyes of both Daniel and Paloma. The inclusion of a third perspective was an interesting choice, that didn't mesh well for me. Regardless, I enjoyed reading this and learning about a story I hadn't heard before. Beautifully written, and not very long! THIS BOOK IS AWESOME. it is unique,because it is written in the form of a poem. it details a jewish family escaping from Berlin to Cuba. This was a great read; however, I felt that there wasn't any real conflict or action. The story went really fast, and Daniel quickly learned how to survive in Cuba without his family. Adolescent literature, interesting topic not widely known. What a beautiful way to tell an important piece of history. Gorgeous and poetic, and perfect for both preteens/teens and adults alike. This free verse novel, written from a first person perspective by three separate and distinct voices, introduces the reader to Daniel, a 13 year old German Jewish refugee who held the hand of his grandfather as he died on Kristalnacht; Paloma, the 12 year old daughter of a corrupt Cuban official who determines, for a high price, who gets a visa to enter Cuba. Paloma also works at a shelter to help the refugees adjust to their new surroundings; and David, an elderly Russian Jew who fled his count This free verse novel, written from a first person perspective by three separate and distinct voices, introduces the reader to Daniel, a 13 year old German Jewish refugee who held the hand of his grandfather as he died on Kristalnacht; Paloma, the 12 year old daughter of a corrupt Cuban official who determines, for a high price, who gets a visa to enter Cuba. Paloma also works at a shelter to help the refugees adjust to their new surroundings; and David, an elderly Russian Jew who fled his country in the 1920s because of pogroms and with whom Daniel is able to communicate in Yiddish. The novel begins in June 1939 and, as each of these three characters tell their story, the reader also learns that Daniel's parents are musicians who decided to save Daniel because they could only scrape together enough money to pay for one ticket on a ship and send him away from the Nazis. It was his and their hope that they would be reunited in New York someday. Paloma, ashamed of her father's abuse of power and the high price he charges desperate people for a visa, works with the American Quakers in Cuba to help people find shelter and provide them with food and clothing more suitable to a warm climate. David, who hands out ice cream and food to the refugees with Paloma, befriends Daniel and convinces him to take off the heavy winter coat he brought from home, and metaphorically shedding his old life. Over time, Daniel, David and Paloma become friends and David helps Daniel begin to move on with his life, though never forgetting his parents. In December 1941, when Japan attacks Pearl Harbor, paranoia that Germany has sent spies to Cuba increases and the Cuban government orders all non-Jewish Germans to be arrested. The three friends watch husbands and wives torn from each other because one spouse is Jewish and the other is Christan, and think of the oldest couple in the shelter. Having crossed Europe together, hiding from Nazis any way they could, Miriam, a Jew, and Marcos, a Christian, are about to be separated in what should have been their place of safety. Are Paloma, Daniel and David willing to risk everything to help this elderly couple hide from the police? Does the fear of German spies mean that ships from Germany will now be turned away from Cuba? Despite being written in free verse, each one of three characters begins to really come to life as they tell their thoughts and secrets and share the different obstacles they must face and overcome, but each is also willing to do what they can to help others in the difficult times and circumstances they find themselves in. This is the fourth book I've read about the experience of Jews fleeing Europe and Hitler's cruelty, seeking refuge in Cuba. This book covers a three year period, from June 1939 to April 1942. Read carefully, because Engle packs a lot of information about life in Cuba during that time as the characters speak. There is both corruption and kindness to be found, as well as the anti-Semitic propaganda campaign launched by Germany in Cuba; the eventual turning away of other ships and forcing them to return to Germany and death, and the rounding up of Christians married to Jews and believed to be spies. Engle includes that and more in her spare, yet graceful poetic style. There are a lot of excellent stories written about the experience of people during the Holocaust, but not many about the experience of Jews and Cuba. Books like Tropical Secrets give us another side of what life was like for Jews living under Hitler and their desperate attempts to escape - sometimes successfully, sometimes not. Ships like Daniels continued to be turned away from the US and Canada, and even though Cuba eventually did the same, it did provide a relatively safe haven for 65,000 refugees. Be sure to read the Author's Note at the end of the book to learn more about Cuba in WWII. Tropical Secrets is a very moving novel about family, friendship, tolerance, love, and survival. Margarita Engle straddles the concept of historical accuracy in storytelling and the poetic outcries of souls in great distress in all of her books, and nowhere does she accomplish it with more grace and ability than in Tropical Secrets. The torturous events of Kristallnacht—the first night of major widespread Nazi violence against the "Sons of Abraham"—were what made young Daniel's parents realize that staying in Germany was not a tenable option for a Jewish family such as themselves. They did their best to stay together, but Daniel became separated anyway, on a boat headed for the Americas with hope for a new start in New York City. Daniel's ship does not find a welcoming harbor in the United States or Canada, but is diverted to the island of Cuba. it's not the dream of New York City that Daniel's parents had wanted, but Daniel still carries the standard of hope that his parents live, and that he will some day soon be able to make his way to the U.S. in order to locate them. Here in Cuba, Daniel finds an old Ukrainian former refuge named David and a girl his own age named Paloma. Each one of them has their own questions, and bears the burden of the secrets that their different lives hold, but the three makeshift companions begin to rely on each other as something of a support system for what they have already faced, and what they will face in the future. Soon, the persecution that had faced the Jews in Germany is turned around, and the red "J" marks on their passports that had made Jews like Daniel targets for oppression at the hands of the fascist German leadership now serves to save their lives. The Cuban government has begun to track down all Nazis and suspected Nazi sympathizers within Cuba's borders, a hunt-and-find which leaves all non-Jewish Germans on Cuba in danger of being harshly interrogated and even taken to jail. As the tumult of a world breaking into pieces intensifies, Daniel, David and Paloma try to make sense of the directions of their own lives and the dreams that fill them like wind in the sails of a becalmed ship. So much has changed, especially for Daniel, but he sees that if he holds onto his dreams—including the dream that his parents might still be alive somewhere out there—then he will always have good reason to keep moving forward. It's somewhat difficult to effectively describe the events of a book such as this one because the plot is so visceral and fluid. Margarita Engle tells the entire story in lovely, flowing verse, which suits the narrative and its characters perfectly. Tropical Secrets is the kind of book that enters a persons consciousness like the ocean waves lapping gently against the sandy beach. The wisdom of the story comes and goes and is an integral part of the whole process of reading about the events and seeing the personal thoughts of the main characters. That constant ebb and flow of wisdom is, above all, what makes this book so good. This is yet a another book I read for my intercultural connections class. The topic of conversation surrounding this book, along with a few others, was “war and political unrest in children’s literature.” I think it was good to discuss how we present such heavy topics to children. I’ve only recently read a little Margarita Engle, and I already love her. I do tend to like novels in verse. They’re quick reads, and because of the poetry the language is on a different caliber than most juvenile fict This is yet a another book I read for my intercultural connections class. The topic of conversation surrounding this book, along with a few others, was “war and political unrest in children’s literature.” I think it was good to discuss how we present such heavy topics to children. I’ve only recently read a little Margarita Engle, and I already love her. I do tend to like novels in verse. They’re quick reads, and because of the poetry the language is on a different caliber than most juvenile fiction. Daniel, a Jewish refugee, is sent to New York by his parents to escape Nazi Germany. When the ship is not allowed to dock at the U.S., they move on to Cuba. There, El Gordo plans to make money off the desperate refugees. This was a new topic for me, and I was invested in the story because I wanted to learn more. It’s disappointing and shameful that the U.S. turned these refugees away. Cuba was hardly any better. I’m not sure who exactly El Gordo is meant to be, but I do know that Fulgencio Batista had a hand in exploiting Jewish desperation at the time. That’s right, I did a little research. Since this was a topic I was unsure about I needed to get some background so I got a feel for the accuracy. Everything seems to line up to me. This would be a nice book to use in a unit on World War II. It could be paired with a nonfiction text about the experiences of Jews who stayed in Germany. It could even be used in an English class studying poetry at the same time students are learning about WWII in a history class. I’m all about aligning curriculum and collaborative teaching. The two main characters, Daniel and Paloma, felt well-developed to me. I found Daniel to be particularly relatable. There were some great moments in the book when his words really spoke to me. See the notable quotes at the end of the book to get a taste of what I mean. Paloma’s character was developed through both her own perspectives and her father’s perspectives. She also presented a perspective from the other side. She is very much directly related to what’s happening in her country, but she doesn’t want to follow her father’s path. The supporting characters seemed more like placeholders. The perspectives swap between Daniel, Paloma, David, and El Gordo. I was loving the tone of the book, until I got to El Gordo’s first chapter. I think his perspective only shows up a few times. It just felt a little insincere and out of place. Every time it would pull me out of the book. This was probably one of my favorite books that we read for this discussion. I got the feeling many of the others enjoyed it, as well. We talked about it for a good while in class. We even discussed a lot of the literary devices, which we hadn’t done very much in the past. It’s not my favorite book by Engle, but I did enjoy it. This was a very interesting way to right a book because it's sorta poem. I give five stars because it was a very well written book about refugees going from Germany to Cuba and of the boy Daniel how he when through the process. It's hard to pass up reading this book about the struggle to survive imagration sorry if I spelled that wrong. It's a really bad book. I don't really like it because it wasn't that good. This review has been hidden because it contains spoilers. To view it, click here. Tropical Secrets by Margarita Engle is a story that focuses on refugees that were turned away from North America and brought to Cuba. The book was very short and is written from three perspectives. Daniel a young jewish german boy, Paloma a native cuban girl, and David a jewish man from Russia maybe. For the most part though it is mostly told and centered around Daniel. I am a student who enjoys learning and talking about history which is why I picked up this book. 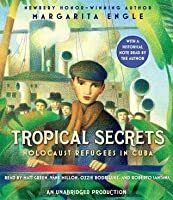 However I really didn’t enjoy i Tropical Secrets by Margarita Engle is a story that focuses on refugees that were turned away from North America and brought to Cuba. The book was very short and is written from three perspectives. Daniel a young jewish german boy, Paloma a native cuban girl, and David a jewish man from Russia maybe. For the most part though it is mostly told and centered around Daniel. I am a student who enjoys learning and talking about history which is why I picked up this book. However I really didn’t enjoy it too much. I did learn a little from it but not too much. It was interesting to hear about the hardships and other issues being told directly from the characters but other than that this book didn’t offer too much. The cover description basically tells the whole story or what little story it offers. The book is written in a format that makes it look like a poem but it really isn’t. This format causes the story to be even shorter because and a lot of excess paper real estate to be wasted. The story is short but it couldn’t be called a short story because it is longer than what one should be. Since the story is written from three perspectives, the name of who is telling the story is always at the top of every page because on almost every page, the book switches perspectives. I found it difficult to read because most books are not written like this. I had to constantly reread pages because I would forget to read the top of the page causing the page to make no sense. I do admit that this is more of a personal problem, however, I feel like I am not the only one who would find this annoying. Margarita Engle is a Cuban-American poet, novelist, and journalist whose work has been published in many countries. She lives with her husband in northern California. even though I am awake.